The EAA Fly-In and Chili cook is happening at the Blairsville Airport from 10a-2p on Saturday. This was a fun event last year, and the wife and I are planning to attend again this year if weather permits. Is anybody else attending? FastEddie? Flocker? Last year we were witness to many thrilling displays of airmanship in a spot landing contest, as well as a display by a Cub driver of "what not to do in an airplane." MrMorden wrote: The EAA Fly-In and Chili cook is happening at the Blairsville Airport from 10a-2p on Saturday. This was a fun event last year, and the wife and I are planning to attend again this year if weather permits. Is anybody else attending? FastEddie? Flocker? Thanks for the heads up. We're closing on our new home on Friday and we're moving in on Saturday. Wx permitting, I do plan to fly in to the airshow at RMG on Sunday. I'll post the link in a different thread. I hope you are right. We will have to meet up some other time, you are not that far away. The Blairsville fly-in was fun, though turnout was light because of the airshow in Rome. My wife and I flew up in the CTSW, accompanies by my friend Kip in his Waiex (Y-tailed Sonex). My max cruise was about the same speed as his economy cruise, so it worked out pretty well. Winds were gusty, but generally under ten knots at the ground. Just enough to make it fun without causing cold sweats. And on the way home the tailwind at altitude allowed the CT to get a new GPS ground speed record in level flight...144 knots (~166mph). Nice pix, Andy. Thanks for posting. That event is sponsored by my EAA group, and Karen normally brings some of her world-famous vegetarian chili and cornbread. This year we skipped it in favor of Blue Ridge's "Paws in the Park". Jake had a pretty aggressive melanoma removed from his tongue a few months back, and while they seemed to get all of it, the prognosis is still not great. Neither radiation nor an oral cancer vaccine seem very effective at actually buying them time, so his time remaining with us may be measured more in months rather than years. Anyway, glad you enjoyed it, even without the "drunken Cub" routine from last year! 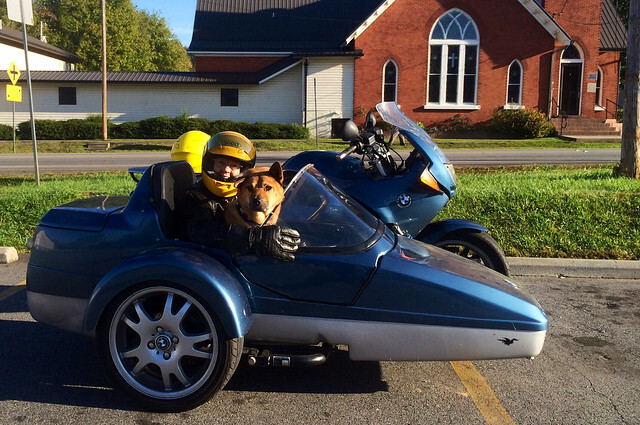 Eddie, I never realized you have a sidecar for your BMW. Very pretty! MrMorden wrote: And on the way home the tailwind at altitude allowed the CT to get a new GPS ground speed record in level flight...144 knots (~166mph).